From 12 to 14 June, ICOE takes place in Cherbourgh, France. As an addition to that, MET-CERTIFIED would like to offer you a visit to the IFREMER test facility in Boulogne-sur-Mer on 15 June. 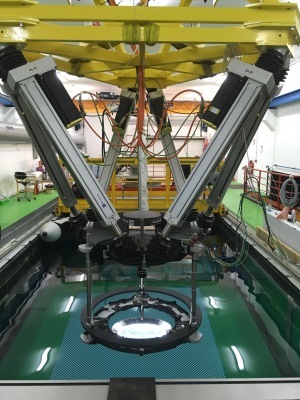 The test tank in Boulogne-sur-Mer can evaluate the behavior of objects in currents or in movement at significant speeds on scale models (or full-scale if the object is small), bottom towed (fishing) gear, propelled or moored devices, fully immersed or buoyant (seismic instruments). In the field of marine renewable energies, the tank is particularly adapted for testing underwater turbines. The test tank in Boulogne-sur-Mer is equipped with a wide panel of accurate measuring instruments specific to hydrodynamics that can record the main mechanical stresses acting on the tested objects as well as monitor and visualise flow and the dynamic behavior of the model (2D laser Doppler 2D velocimetry, 2D particle image velocimetry, multi-component strain gauge balances, 3D air-water trajectometry system, hexapod). IFREMER is a partner in the MET-CERTIFIED project. In the project, IFREMER wishes to promote expertise and to improve R&D competencies in hydrodynamic studies on marine current turbines. The ability to conduct scale testing in the IFREMER wave and current flume tank under international standards and to help for the development of the certification scheme is also of high interest. IFREMER is in charge of the four experimental trials on tidal energy devices. During these tests the IEC Tidal Scale testing procedures will be applied and evaluated for verification of scale testing standards for controlled conditions and its use to predict performance at higher TRLs in open water. The visit is free of charge but registrations are mandatory and can be done via this link. For more information, please contact dominique.dhondt@ugent.be.